Atul Gawande (on doctors and computers, Nov. 12 issue) is good as always. I found that one more boring than his usual. Still, interesting points. I quoted it at work because our computer system there is terrible: unintuitive, confusing, wayyy too complicated. I prefer to write in Word and then paste it into the system because the word-processing part is so bad. Presumably it makes the whole process -- writer to editor to copy desk to designer to printer -- easier somehow, although everyone complains about it. I read fervently Rebecca Mead's article on podcasting in the November 19 issue. It was terribly long, but I just couldn't put it down. My father's primary care physician is dealing with just such issues as Gawande discusses. I'm sure it must be weird to enjoy an article about how we are destroying the planet, thanks to Exxon, the Koch brothers, et al,, and thus how we are destroying ourselves (I mean humankind), but I always enjoy reading Bill McKibben (Nov. 26). My favourite cartoons in the last issue of the year are on pages 57 and 70. No, they're not political. What are yours? paving his way to the Presidency. "Expedition: Robinson,” a Swedish reality-television program, premièred in the summer of 1997, with a tantalizing premise: sixteen strangers are deposited on a small island off the coast of Malaysia and forced to fend for themselves. To survive, they must coöperate, but they are also competing: each week, a member of the ensemble is voted off the island, and the final contestant wins a grand prize. The show’s title alluded to both “Robinson Crusoe” and “The Swiss Family Robinson,” but a more apt literary reference might have been “Lord of the Flies.” The first contestant who was kicked off was a young man named Sinisa Savija. Upon returning to Sweden, he was morose, complaining to his wife that the show’s editors would “cut away the good things I did and make me look like a fool.” Nine weeks before the show aired, he stepped in front of a speeding train. The first season was set in Borneo, and from the moment it aired, on CBS, in 2000, “Survivor” was a ratings juggernaut: according to the network, a hundred and twenty-five million Americans—more than a third of the population—tuned in for some portion of the season finale. The catchphrase delivered by the host, Jeff Probst, at the end of each elimination ceremony, “The tribe has spoken,” entered the lexicon. Burnett had been a marginal figure in Hollywood, but after this triumph he, too, was rebranded, as an oracle of spectacle. Les Moonves, then the chairman of CBS, arranged for the delivery of a token of thanks—a champagne-colored Mercedes. To Burnett, the meaning of this gesture was unmistakable: “I had arrived.” The only question was what he might do next. A few years later, Burnett was in Brazil, filming “Survivor: The Amazon.” His second marriage was falling apart, and he was staying in a corporate apartment with a girlfriend. One day, they were watching TV and happened across a BBC documentary series called “Trouble at the Top,” about the corporate rat race. The girlfriend found the show boring and suggested changing the station, but Burnett was transfixed. He called his business partner in L.A. and said, “I’ve got a new idea.” Burnett would not discuss the concept over the phone—one of his rules for success was to always pitch in person—but he was certain that the premise had the contours of a hit: “Survivor” in the city. Contestants competing for a corporate job. The urban jungle! In 2002, Burnett rented Wollman Rink, in Central Park, for a live broadcast of the Season 4 finale of “Survivor.” The property was controlled by Donald Trump, who had obtained the lease to operate the rink in 1986, and had plastered his name on it. Before the segment started, Burnett addressed fifteen hundred spectators who had been corralled for the occasion, and noticed Trump sitting with Melania Knauss, then his girlfriend, in the front row. Burnett prides himself on his ability to “read the room”: to size up the personalities in his audience, suss out what they want, and then give it to them. Cut to: June, 2015. After starring in fourteen seasons of “The Apprentice,” all executive-produced by Burnett, Trump appeared in the gilded atrium of Trump Tower, on Fifth Avenue, to announce that he was running for President. Only someone “really rich,” Trump declared, could “take the brand of the United States and make it great again.” He also made racist remarks about Mexicans, prompting NBC, which had broadcast “The Apprentice,” to fire him. Burnett, however, did not sever his relationship with his star. He and Trump had been equal partners in “The Apprentice,” and the show had made each of them hundreds of millions of dollars. They were also close friends: Burnett liked to tell people that when Trump married Knauss, in 2005, Burnett’s son Cameron was the ring bearer. Tony Schwartz, who wrote “The Art of the Deal,” which falsely presented Trump as its primary author, told me that he feels some responsibility for facilitating Trump’s imposture. But, he said, “Mark Burnett’s influence was vastly greater,” adding, “ ‘The Apprentice’ was the single biggest factor in putting Trump in the national spotlight.” Schwartz has publicly condemned Trump, describing him as “the monster I helped to create.” Burnett, by contrast, has refused to speak publicly about his relationship with the President or about his curious, but decisive, role in American history. When Burnett left the Army, after five years, his plan was to find work in Central America as a “weapons and tactics adviser”—not as a mercenary, he later insisted, though it is difficult to parse the distinction. Before he left, his mother told him that she’d had a premonition and implored him not to take another job that involved carrying a gun. Like Trump, Burnett trusts his impulses. “Your gut instinct is rarely wrong,” he likes to say. During a layover in Los Angeles, he decided to heed his mother’s admonition, and walked out of the airport. He later described himself as the quintessential immigrant: “I had no money, no green card, no nothing.” But the California sun was shining, and he was eager to try his luck. Burnett is an avid raconteur, and his anecdotes about his life tend to have a three-act structure. In Act I, he is a fish out of water, guileless and naïve, with nothing but the shirt on his back and an outsized dream. Act II is the rude awakening: the world bets against him. It’s impossible! You’ll lose everything! No such thing has ever been tried! In Act III, Burnett always prevails. Not long after arriving in California, he landed his first job—as a nanny. Eyebrows were raised: a commando turned nanny? Yet Burnett thrived, working for a family in Beverly Hills, then one in Malibu. As he later observed, the experience taught him “how nice the life styles of wealthy people are.” Young, handsome, and solicitous, he discovered that successful people are often happy to talk about their path to success. On “Survivor,” the competitors were split into teams, or “tribes.” In this raw arena, Burnett suggested, viewers could glimpse the cruel essence of human nature. It was undeniably compelling to watch contestants of different ages, body types, and dispositions negotiate the primordial challenges of making fire, securing shelter, and foraging for food. At the same time, the scenario was extravagantly contrived: the castaways were shadowed by camera crews, and helicopters thundered around the island, gathering aerial shots. Richard Levak, a clinical psychologist who consulted for Burnett on “Survivor” and “The Apprentice” and worked on other reality-TV shows, told me that producers have often liked people he was uncomfortable with for psychological reasons. Emotional volatility makes for compelling television. But recruiting individuals for their instability and then subjecting them to the stress of a televised competition can be perilous. When Burnett was once asked about Sinisa Savija’s suicide, he contended that Savija had “previous psychological problems.” No “Survivor” or “Apprentice” contestants are known to have killed themselves, but in the past two decades several dozen reality-TV participants have. Levak eventually stopped consulting on such programs, in part because he feared that a contestant might harm himself. “I would think, Geez, if this should unravel, they’re going to look at the personality profile and there may have been a red flag,” he recalled. Burnett excelled at the casting equation to the point where, on Season 2 of “Survivor,” which was shot in the Australian outback, his castaways spent so much time gossiping about the characters from the previous season that Burnett warned them, “The more time you spend talking about the first ‘Survivor,’ the less time you will have on television.” But Burnett’s real genius was in marketing. When he made the rounds in L.A. to pitch “Survivor,” he vowed that it would become a cultural phenomenon, and he presented executives with a mock issue of Newsweek featuring the show on the cover. (Later, “Survivor” did make the cover of the magazine.) Burnett devised a dizzying array of lucrative product-integration deals. In the first season, one of the teams won a care package that was attached to a parachute bearing the red-and-white logo of Target. Around this time, Burnett stopped giving interviews about Trump or “The Apprentice.” He continues to speak to the press to promote his shows, but he declined an interview with me. Before Trump’s Presidential run, however, Burnett told and retold the story of how the show originated. When he met Trump at Wollman Rink, Burnett told him an anecdote about how, as a young man selling T-shirts on the boardwalk on Venice Beach, he had been handed a copy of “The Art of the Deal,” by a passing rollerblader. Burnett said that he had read it, and that it had changed his life; he thought, What a legend this guy Trump is! Anyone else hearing this tale might have found it a bit calculated, if not implausible. Kym Gold, Burnett’s first wife, told me that she has no recollection of him reading Trump’s book in this period. “He liked mystery books,” she said. But when Trump heard the story he was flattered. Burnett has never liked the phrase “reality television.” For a time, he valiantly campaigned to rebrand his genre “dramality”—“a mixture of drama and reality.” The term never caught on, but it reflected Burnett’s forthright acknowledgment that what he creates is a highly structured, selective, and manipulated rendition of reality. Burnett has often boasted that, for each televised hour of “The Apprentice,” his crews shot as many as three hundred hours of footage. The real alchemy of reality television is the editing—sifting through a compost heap of clips and piecing together an absorbing story. Jonathon Braun, an editor who started working with Burnett on “Survivor” and then worked on the first six seasons of “The Apprentice,” told me, “You don’t make anything up. But you accentuate things that you see as themes.” He readily conceded how distorting this process can be. Much of reality TV consists of reaction shots: one participant says something outrageous, and the camera cuts away to another participant rolling her eyes. Often, Braun said, editors lift an eye roll from an entirely different part of the conversation. Trump maximized his profits from the start. When producers were searching for office space in which to stage the show, he vetoed every suggestion, then mentioned that he had an empty floor available in Trump Tower, which he could lease at a reasonable price. (After becoming President, he offered a similar arrangement to the Secret Service.) When the production staff tried to furnish the space, they found that local venders, stiffed by Trump in the past, refused to do business with them. When I watched several dozen episodes of the show recently, I saw no hint of deliberate irony. Admittedly, it is laughable to hear the candidates, at a fancy meal, talk about watching Trump for cues on which utensil they should use for each course, as if he were Emily Post. But the show’s reverence for its pugnacious host, however credulous it might seem now, comes across as sincere. Did Burnett believe what he was selling? Or was Trump another two-dollar T-shirt that he pawned off for eighteen? It’s difficult to say. One person who has collaborated with Burnett likened him to Harold Hill, the travelling fraudster in “The Music Man,” saying, “There’s always an angle with Mark. He’s all about selling.” Burnett is fluent in the jargon of self-help, and he has published two memoirs, both written with Bill O’Reilly’s ghostwriter, which double as manuals on how to get rich. One of them, titled “Jump In! : Even if You Don’t Know How to Swim,” now reads like an inadvertent metaphor for the Trump Presidency. “Don’t waste time on overpreparation,” the book advises. 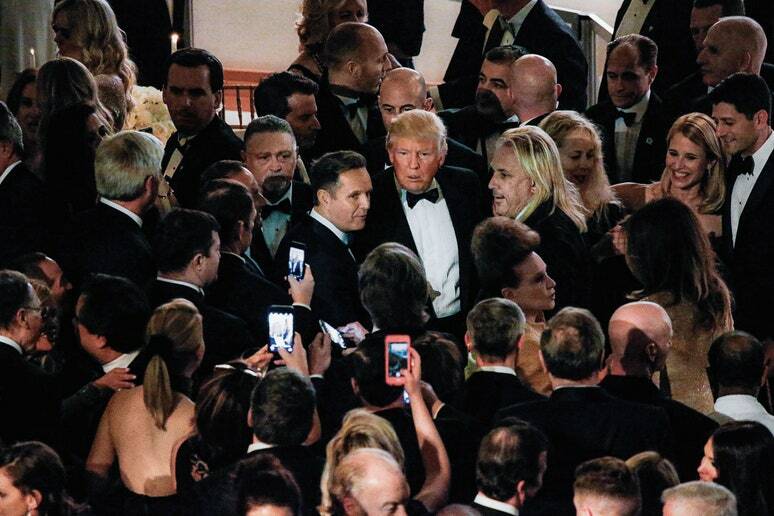 The show was an instant hit, and Trump’s public image, and the man himself, began to change. Not long after the première, Trump suggested in an Esquirearticle that people now liked him, “whereas before, they viewed me as a bit of an ogre.” Jim Dowd, Trump’s former publicist, told Michael Kranish and Marc Fisher, the authors of the 2016 book “Trump Revealed,” that after “The Apprentice” began airing “people on the street embraced him.” Dowd noted, “All of a sudden, there was none of the old mocking,” adding, “He was a hero.” Dowd, who died in 2016, pinpointed the public’s embrace of “The Apprentice” as “the bridge” to Trump’s Presidential run. The show’s camera operators often shot Trump from low angles, as you would a basketball pro, or Mt. Rushmore. Trump loomed over the viewer, his face in a jowly glower, his hair darker than it is now, the metallic auburn of a new penny. (“Apprentice” employees were instructed not to fiddle with Trump’s hair, which he dyed and styled himself.) Trump’s entrances were choreographed for maximum impact, and often set to a moody accompaniment of synthesized drums and cymbals. The “boardroom”—a stage set where Trump determined which candidate should be fired—had the menacing gloom of a “Godfather” movie. In one scene, Trump ushered contestants through his rococo Trump Tower aerie, and said, “I show this apartment to very few people. Presidents. Kings.” In the tabloid ecosystem in which he had long languished, Trump was always Donald, or the Donald. On “The Apprentice,” he finally became Mr. Trump. “We have to subscribe to our own myths,” the “Apprentice” producer Bill Pruitt told me. “Mark Burnett is a great mythmaker. He blew up that balloon and he believed in it.” Burnett, preferring to spend time pitching new ideas for shows, delegated most of the daily decisions about “The Apprentice” to his team, many of them veterans of “Survivor” and “Eco-Challenge.” But he furiously promoted the show, often with Trump at his side. According to many of Burnett’s collaborators, one of his greatest skills is his handling of talent—understanding their desires and anxieties, making them feel protected and secure. On interview tours with Trump, Burnett exhibited the studied instincts of a veteran producer: anytime the spotlight strayed in his direction, he subtly redirected it at Trump. Burnett, who was forty-three when Season 1 aired, described the fifty-seven-year-old Trump as his “soul mate.” He expressed astonishment at Trump’s “laser-like focus and retention.” He delivered flattery in the ostentatiously obsequious register that Trump prefers. Burnett said he hoped that he might someday rise to Trump’s “level” of prestige and success, adding, “I don’t know if I’ll ever make it. But you know something? If you’re not shooting for the stars, you’re not shooting!” On one occasion, Trump invited Burnett to dinner at his Trump Tower apartment; Burnett had anticipated an elegant meal, and, according to an associate, concealed his surprise when Trump handed him a burger from McDonald’s. Trump liked to suggest that he and Burnett had come up with the show “together”; Burnett never corrected him. When Carolyn Kepcher, a Trump Organization executive who appeared alongside Trump in early seasons of “The Apprentice,” seemed to be courting her own celebrity, Trump fired her and gave on-air roles to three of his children, Ivanka, Donald, Jr., and Eric. Burnett grasped that the best way to keep Trump satisfied was to insure that he never felt upstaged. “It’s Batman and Robin, and I’m clearly Robin,” he said. It was. Season 1 of “The Apprentice” flogged one Trump property after another. The contestants stayed at Trump Tower, did events at Trump National Golf Club, sold Trump Ice bottled water. “I’ve always felt that the Trump Taj Mahal should do even better,” Trump announced before sending the contestants off on a challenge to lure gamblers to his Atlantic City casino, which soon went bankrupt. The prize for the winning team was an opportunity to stay and gamble at the Taj, trailed by cameras. NBC executives were so enamored of their new star that they instructed Burnett and his producers to give Trump more screen time. This is when Trump’s obsession with television ratings took hold. “I didn’t know what demographics was four weeks ago,” he told Larry King. “All of a sudden, I heard we were No. 3 in demographics. Last night, we were No. 1 in demographics. And that’s the important rating.” The ratings kept rising, and the first season’s finale was the No. 1 show of the week. For Burnett, Trump’s rehabilitation was a satisfying confirmation of a populist aesthetic. “I like it when critics slam a movie and it does massive box office,” he once said. “I love it.” Whereas others had seen in Trump only a tattered celebrity of the eighties, Burnett had glimpsed a feral charisma. On June 26, 2018, the day the Supreme Court upheld President Trump’s travel ban targeting people from several predominantly Muslim countries, Secretary of State Mike Pompeo sent out invitations to an event called a Ministerial to Advance Religious Freedom. If Pompeo registered any dissonance between such lofty rhetoric and Administration policies targeting certain religions, he didn’t mention it. At the State Department, Burnett mentioned religious intolerance “throughout the Middle East,” genocide in Darfur, and the persecution of religious minorities in Myanmar. “I’m simply a TV producer,” he said, noting that he was “far less educated” than his audience. But he was good at communicating with the masses, he went on. He explained his formula for storytelling: “K-I-S-S—‘Keep it simple, stupid.’ ” Burnett said that when he and Downey travel, strangers sometimes “ask her to lay her hands upon them,” as if she were actually an angel. This, he confided, is “the power of media.” He suggested that his position in Hollywood gave him some leverage when it came to pressing politicians to do the right thing: “In the end, nobody wants to look bad in the media.” But Burnett did not cite any controversial White House policies that he hoped to change; he didn’t even mention Trump’s name. In the opening episode of Season 11, the theatrical tension of the boardroom was suddenly punctured by an electronic trill. “Whose cell phone?” Trump growled. “How do I turn this off?” Busey stuttered, fumbling with the tiny buttons. “Gary, turn your cell phone off!” Trump said. It is strange to watch this kind of malarkey now and consider that only a few years later one of these men would be President. I spoke to several people who recalled Burnett telling them that he was busy working on the Inauguration. A Democratic political operative who was involved in a back-channel campaign to dissuade big-name stars from appearing at the event told me that Burnett had tried to enlist musicians to perform. “Mark was somebody we were actively working against,” the operative said. Trump’s wish list included Elton John, Aretha Franklin, and Paul Anka—who, he hoped, would sing “My Way”—but they all claimed to be otherwise engaged. The event ended up with sparse crowds and a feeble roster of performers. On October 8, 2016, the day after the Washington Post released the “Access Hollywood” tape in which Trump was caught on a hot mike bantering about grabbing women’s crotches, Bill Pruitt tweeted, “As a producer on seasons 1 & 2 of #theapprentice I assure you: when it comes to the #trumptapes there are far worse.” In other interviews, Pruitt said that, during his time on “The Apprentice,” he’d heard Trump make not only sexist statements but also racist ones. This was not so difficult to imagine. Trump’s natural idiom is vulgarity, and the targets of his ire—Colin Kaepernick, “shithole countries,” any African-American journalist who asks him a tough question—are clearly not chosen at random. Part of what was mesmerizing about him, to Mark Burnett and, ultimately, to the American people, was his compulsion for offensive talk. Trump generally answers such criticism with a hyperventilating rebuttal, but he didn’t fire back at Burnett—at least not publicly—and their friendship does not appear to have suffered. Scarcely two months after issuing his statement about not being “Pro-Trump,” Burnett attended a fund-raiser for the President-elect at Cipriani, in New York, and in January, 2017, he and his two sons flew to Washington for the Inauguration. Burnett may have wanted to downplay his friendship with the President, but Trump felt no similar compunction. Last March, at a rally in Richfield, Ohio, he announced, “I got a call from Mark Burnett! He did ‘The Apprentice,’ he’s a great guy. He said, ‘Donald, I called just to say hello and to tell you, did you see Roseanne’s ratings?’ ” (Roseanne Barr, a rare Trump supporter in Hollywood, had just rebooted her sitcom.) “I said, ‘Mark, how big were they?’ ‘They were unbelievable! Over eighteen million people!’ ” When I asked Burnett’s representatives about the President’s characterizations of his exchanges with Burnett, they declined to either confirm or deny their accuracy. As a winner, Pinkett went to work for the Trump Organization. “The closer I got to Donald, the less I liked what I saw,” he recalled. “It’s like a person with bad breath.” After Pennsylvania legalized casino gambling, in 2004, Trump applied for a license to build a casino in a predominantly African-American community. “The community hated Donald,” Pinkett said. So the company dispatched Pinkett as an advocate. Upon returning, he said, “I’m not going out there again to represent you folks.” The Trump Organization was using him like a prop, he felt, and he did not want to sell a project that the community so roundly opposed. The casino was never built. Even the grand prize on “The Apprentice” was a bit of a fake, Pinkett told me. His Trump Organization job was actually paid for by NBC. “It wasn’t even his money!” he said. Burnett was recruited to the television arm of M-G-M in 2015, by Gary Barber, the company’s chairman and C.E.O. Barber, a former accountant, had brought the studio back from bankruptcy, slashing costs and shepherding profitable titles like the James Bond franchise. In his effort to build up M-G-M, Barber wanted to augment the studio’s television business. So he bought Burnett’s company and enlisted him tooversee television production. 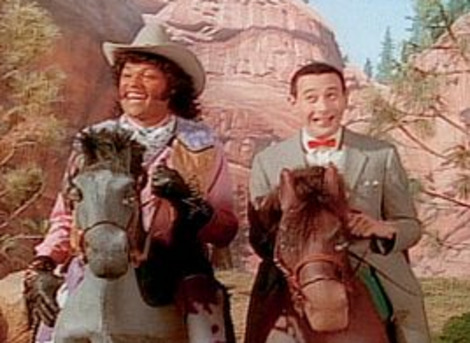 Ostensibly, Barber and Burnett got along. But, whereas Mark Burnett Productions had been characterized by profligate dazzle, Barber was thrifty, and monitored every expense. The chairman of M-G-M’s board is Kevin Ulrich, a financier whose private-equity fund holds a controlling stake in the company. People who know Ulrich describe him as someone who relishes the flashy perquisites of Hollywood moguldom. Whereas Barber liked to spend weekends quietly tending to the racehorses he owns, Ulrich liked going to parties and premières. Barber was interested in selling the studio—a move that Ulrich opposed. According to several sources, Burnett began cultivating Ulrich, inviting him to events and introducing him to celebrities. Then, last March, M-G-M’s board informed Barber that he had been fired; he had just signed a contract extension, so the studio would pay him two hundred and sixty million dollars to leave. Despite this payment, he was incensed. Three months after Barber’s ouster, Burnett was promoted to chairman of television at M-G-M. Barber declined to speak with me, but a friend of his said that he was “blindsided” by his ouster: Burnett had made an alliance with Ulrich and got Barber kicked off the island. He had now achieved such a level of power that, even in reflexively liberal Hollywood, his association with Trump was discussed mostly in whispers. Many people who spoke to me for this piece would not do so on the record, citing fears of being blacklisted. Nevertheless, “The Apprentice” continues to dog Burnett. In 2017, when he took the stage at the Producers Guild of America Awards to accept the award for Outstanding Producer of Competition Television, there were boos in the audience. In September, he skipped the Emmy Awards, though “The Voice” and “Shark Tank” were nominated; the night before the ceremony, however, he and Downey attended the annual gala for the Motion Picture & Television Fund, at a hotel in Century City. Walking into the event, they had a confrontation with the actor Tom Arnold. Arnold, a wild-eyed industry veteran best known for his role in the 1994 film “True Lies” and for a former marriage to Roseanne Barr, had been on a quest to uncover damaging “Apprentice” outtakes of Donald Trump. He had even launched a gonzo TV show, produced by Vice, called “The Hunt for the Trump Tapes.” As Arnold relates on the show, he and Trump knew each other for years, because they had occupied “the same level of Hollywood.” Indeed, in 2010, Burnett had e-mailed Arnold, “Is there any way I can get you to do Celeb Apprentice? . . . I do think that Celeb Apprentice has an awesome brand. Trump really wants you. I really want you.” Arnold was, in his own estimation, a prankster and a marginal celebrity. And it disturbed him to think that someone just like him might be entrusted with managing the country. It might seem improbable that Burnett, the smiling glad-hander, would physically attack someone. But it would not be unprecedented. His second wife, Dianne Burnett, told me that one day, in Santa Monica, Mark left her and one of their sons in the car in order to fetch frozen yogurt. While he was gone, a vagrant began aggressively banging on the car window, presumably in search of a donation. When Burnett returned, Dianne recalled, he punched the man in the face, knocking him down, then drove away. Hours after the Century City event, TMZ published an account by an eyewitness, who said that “Mark had his hands on Tom’s throat, and Tom was tearing at Mark’s shirt and ripping off his crucifix.” The authorities have declined to press charges against Burnett, and several people close to him characterized Arnold as a puerile stunt artist who cornered Burnett in a bit of performance art in order to promote his lousy show. After Season 1 of “Survivor,” a contestant named Stacey Stillman sued CBS and Burnett, claiming that he had improperly shaped the competition by whispering to contestants about whom they should vote to eliminate. In a deposition, another cast member said that Burnett “believed that certain people would make a better TV show than others, and he did what he could to have influence over those people staying on the island.” Burnett denied any wrongdoing, and the suit was ultimately settled. One consequence of the lawsuit was that, when it came time to make “The Apprentice,” producers tried to have cameras on Donald Trump from the moment he walked onto the set until the moment he left—and all that footage was preserved. When M-G-M bought Burnett’s company, it assumed ownership of those outtakes and, after the “Access Hollywood” tape leaked, it had to contend with public demands to unseal the “Apprentice” tapes. Marvin Putnam, a lawyer who represents M-G-M, told me, “Mark Burnett cannot release the tapes. Period. 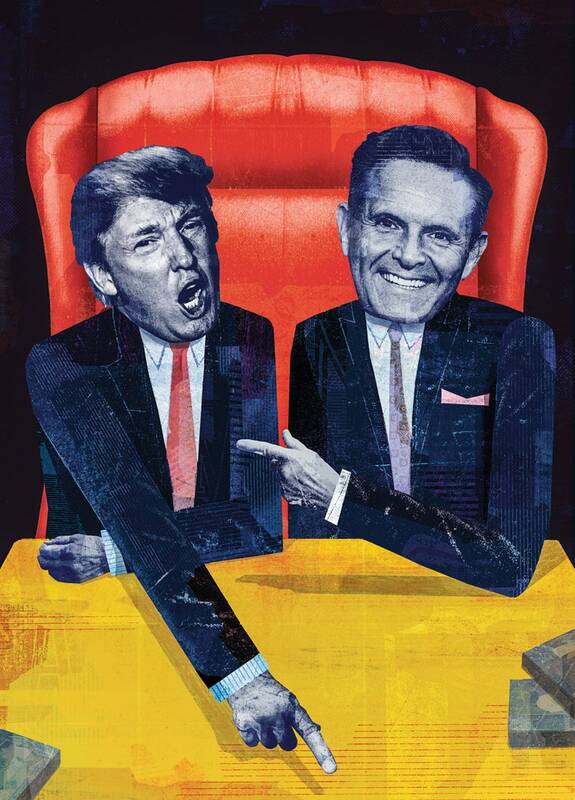 Even if Mark Burnett wanted to release the tapes, Mark Burnett cannot release the tapes.” Putnam explained that the contracts that Trump and other cast members signed contained standard industry stipulations limiting the manner in which outtakes and other footage could be used. These are binding obligations, which means that if M-G-M were to violate them—by releasing footage not just of Trump but of anyone who appeared with him onscreen—the studio could be sued. Brian Edwards, the president of television operations at M-G-M, who has worked with Burnett for more than a decade, pointed out that, even without such legal constraints, Burnett couldn’t release the tapes—if he did, talent would refuse to work with him in the future. “If everybody in reality television knew that their outtakes were going to be made public at the first sign of pressure, what do you think would happen to the business?” Edwards asked. Neither Putnam nor Edwards would comment on whether M-G-M possesses tapes in which Trump says something offensive; nor would they say how much, if any, of the archive has been reviewed. Over the fourteen seasons hosted by Trump, nearly two hundred hours of “The Apprentice” aired on NBC. If Burnett indeed shot three hundred hours of footage for each episode, there could be some sixty thousand hours of outtakes to sift through. To Braun, the hunt for the tapes feels like a distraction. “We’ve seen that it doesn’t matter,” he said. “He now says plenty of things that are outwardly racist, misogynist, and fascist. It just doesn’t hurt him.” After Manigault Newman made her claims about the “Apprentice” tapes, The Economist conducted a survey, and found that seventy-seven per cent of white Trump voters felt that “it is possible that a person who uses the ‘N-word’ while in office can still be a good President.” More than a third of white Trump voters admitted to using the word themselves. Burnett heard her out. “I’m not into politics,” he told her. “I’m not even on Twitter.” But he said that he had no intention of speaking out against Trump or of releasing any tapes. “I’m just a guy who produces shows,” he insisted. Burnett’s myopia about politics may be selective, but that does not mean it is feigned. He would hardly be the first Hollywood chieftain with a dim grasp of current events beyond Los Angeles, but even by industry standards he can seem remarkably disconnected. Shortly after the mass shooting at Marjory Stoneman Douglas High School, in Parkland, Florida, this past February, Burnett attended a regular meeting of television executives at M-G-M. At one point, someone mentioned the marketing plan for a project in the studio’s film division: a remake of “Death Wish,” starring Bruce Willis. The movie, about an armed vigilante, was unabashedly pro-gun—Breitbart eventually hailed it as an “N.R.A. Public Service Announcement.” Someone asked whether M-G-M would be altering the rollout of the film, in light of the shooting. There has likely never been a man who, in his own lifetime, has been as widely spoken and written about as Donald Trump. Politics has never been so spellbinding. “It’s the reason people watch a schoolyard fight,” Levak said. “It’s vicariously watching someone act out and get away with it.” Burnett once remarked that “Lord of the Flies” is so absorbing because all the characters are suddenly transported into a world in which “the rules are changed, and convention, law, and morality are suspended.” It’s an apt paraphrase of the Trump Presidency. On Sunday afternoons, Burnett likes to pour himself a generous glass of wine and stroll out onto the balcony of his seven-thousand-square-foot home, off the Pacific Coast Highway in Malibu. He and Downey refer to the property, which was undamaged by the recent wildfires, as the Sanctuary. It is an exquisite spot, with white couches facing an unbroken view of the ocean. Burnett likes to reflect on the fact that his mansion is not far from one of the homes where, as a young immigrant, he worked as a nanny. He is on social media, as it happens. He seldom tweets, but he’s active on Instagram. Along with family snapshots and photographs of Burnett palling around with celebrities and religious figures, there are a couple of videos he has taken of himself relaxing on the balcony. Patrick Radden Keefe, a staff writer, has been contributing to The New Yorker since 2006. His new book, “Say Nothing: A True Story of Murder and Memory in Northern Ireland,” will be published in the U.S. in February. newyorker.com. Being terminally behind in my reading, I just finished Ariel Levy's profile of Julia Louis-Dreyfus (Dec. 17). I'm afraid I'm obsessing on something that's important to J.L.D. 's life but not so much to the profile. Levy mentions the death of J.L.D. 's "youngest sister, Emma," but she also mentions that J.L.D. 's parents separated when she was one year old, and that her mother remarried. That marriage gave J.L.D. two half sisters, but in further discussion of the family, Emma is not mentioned. I'm guessing Emma was also a half sister, from a remarriage of J.L.D. 's father, since they were both on the board of trustees of her father's art collection.